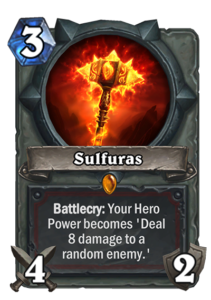 Fire Plume’s Heart is a quest to play seven taunt minions, and the reward is massive: Sulfuras, the weapon of Ragnaros himself, which in addition to being an actual 3-mana 4/2 weapon, also gives you Ragnaros’s Hero Power, deal 8 damage to a random enemy. Talk about a win condition! As cool as this sounds, the road to get there may not be that easy. First of all, notice the the taunt minions have to be played, not summoned. So, no, you cannot cheat out more taunt minions with N’Zoth for quest credit. Journey to Un’Goro gives us a big bunch of new taunts, especially as Warrior class minions, so let’s take a look at our toolbox. 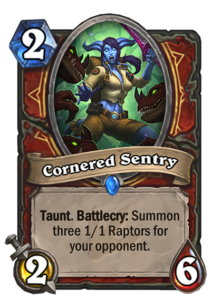 Cornered Sentry is a Warrior 2-mana 2/6 Taunt with a Battlecry to summon three 1/1 Raptors for your opponent. If the 1/1s were to trade into the Sentry, you would be left with a 2/3 for 2, the average value. Cornered Sentry is an interesting card with lots of potential synergies, as long as you don’t go ahead and play it on 2. Cornered Sentry is usually not a turn 2 play though, and then it comes into competition with Dirty Rat. 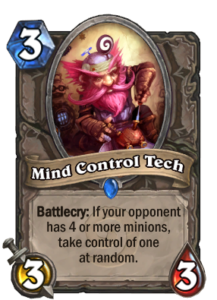 Dirty Rat into Brawl or Dirty Rat into Mind Control Tech are already common plays, and it is unclear whether Cornered Sentry ends up being better. 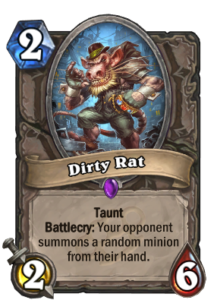 In large part, it depends on the meta: Dirty Rat can be used to deny plays from the opponent, Cornered Sentry cannot. I like this little guy. It is a 3-mana 1/4 Taunt with a Battlecry to Discover a Taunt. OK, the statline is pretty bad, but what is a Control Warrior going to do on three? 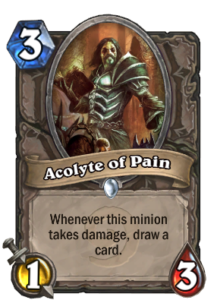 Play Acolyte of Pain? I think Stonehill Defender has a good chance to replace Acolyte of Pain in Quest Warrior decks. 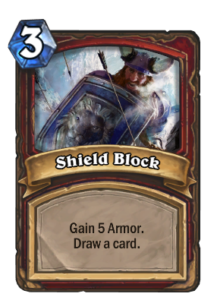 It gives you quest credit and a card that is guaranteed to give more quest credit, and as class cards are more likely to appear from Discover and Warrior now has multiple good class taunts, your odds of picking up a nice card from the Defender are really good. Warrior does not even mind that 1/4 statline that much. One damage can be all it takes to enable an Execute or trade away a bigger minion with the help of Slam or Fiery War Axe. Acolyte of Pain still gives you potential for more card draw, but Stonehill Defender is close enough that the quest is likely to push it into the decklists. While Tar Creeper is looking like an Elemental deck staple, it is such a good defensive minion that it will probably earn itself a spot outside Elemental decks as well, in Control decks and maybe even in Zoo to protect your early board. A 3-mana 1/5 Elemental with Taunt that has +2 attack on your opponent’s turn, it’s a Sen’Jin Shieldmasta that comes out one turn early. On defense, that is. 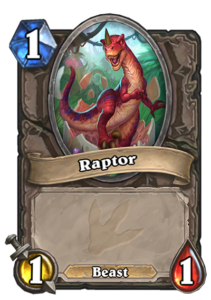 There are lots of cards with this mechanic in Journey to Un’Goro, and Tar Creeper is the one with the most uses: the mechanic generally becomes weaker as the game progresses, as any deck has to look for some offensive power at some point. An early defensive minion, on the other hand, can find home in many decks that are looking to get aggressive a bit later. 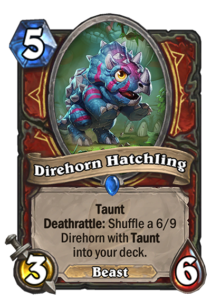 Another Warrior class Taunt, Direhorn Hatchling is a 5-mana 3/6 Beast with Taunt and with a Deathrattle to shuffle a 5-mana 6/9 taunt into your deck. 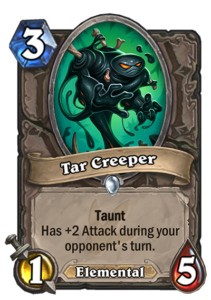 When played, it’s a Fen Creeper, a card that never really saw play, but the fact that it shuffles another taunt into your deck makes it very attractive for Quest Warriors. Direhorn Hatchling might also be interesting in a pure N’Zoth deck, as pulling a bunch of taunts from N’Zoth can be really strong. I don’t see N’Zoth having a space in Quest decks though, as it cannot advance the quest with the minions it summons. 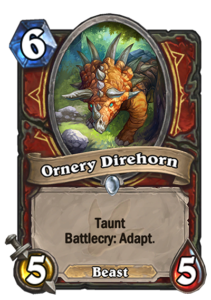 Yet another Warrior class Taunt, Ornery Direhorn is a 6-mana 5/5 Beast with Taunt and Battlecry to Adapt. Overall, it’s an OK card, not amazing, not bad. 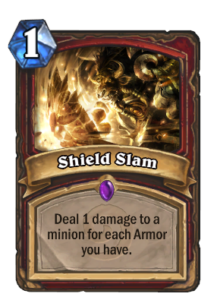 There are some useless adapts out there for a minion like this, but playing a 5/8, 6/6, or a 5/5 that cannot be targeted with spells or hero powers is OK.
Warrior is getting so many class taunts. 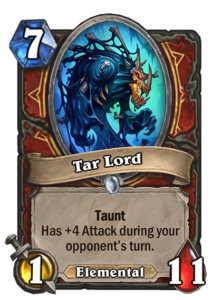 Tar Lord is a 7-mana 1/11 Elemental with Taunt and +4 attack during your opponent’s turn. A very defensive option, it has better stats than Ancient of War on your opponent’s turn, but cannot do anything offensively. I don’t really like high-cost minions with this characteristic: you need to really want to protect something or rely on a different win condition altogether to use them. I’m not sure if even Ragnaros Hero Power is worth running such an ultra-defensive late-game card. 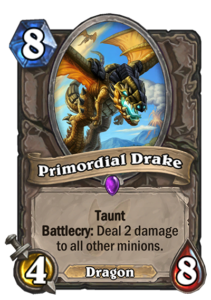 The only Dragon in Un’Goro, Primordial Drake is an 8-mana 4/8 Dragon with Taunt and a Battlecry to Deal 2 damage to all other minions. It costs a lot, but it is a powerful card, especially if any board-flooding strategies become common. It also gives Warriors aspiring to complete the quest a good reason to run The Curator: with multiple new Warrior class taunts being Beasts and this being a Dragon, The Curator suddenly becomes quite good at drawing Taunts from your deck. 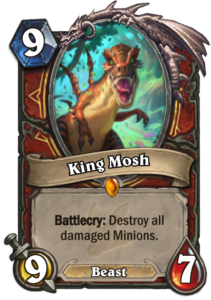 I have already reviewed King Mosh in detail elsewhere, and it is obviously not a taunt minion, but it gives Warrior a good potential late-game board clear: something that synergizes well with the intention to randomly shoot your way to victory. 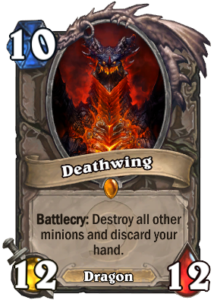 There is an argument to be made for running Deathwing instead: more unconditional clear and can be drawn from The Curator, but King Mosh also has its upsides as it can also clear selectively and does not discard your hand. There are two paths to choose from: Control or Tempo. 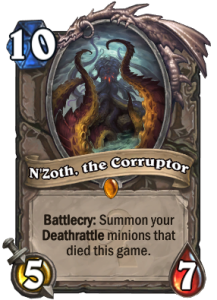 I don’t think it will be possible to fit in N’Zoth into a Quest Warrior list, but that would be another subtype of Control if it is shown to be possible. Here is my initial draft for a Control Quest Warrior. The deck places heavy emphasis on removing your opponent’s threats and surviving, with the Ragnaros Hero Power as the sole win condition against anything but aggro decks. 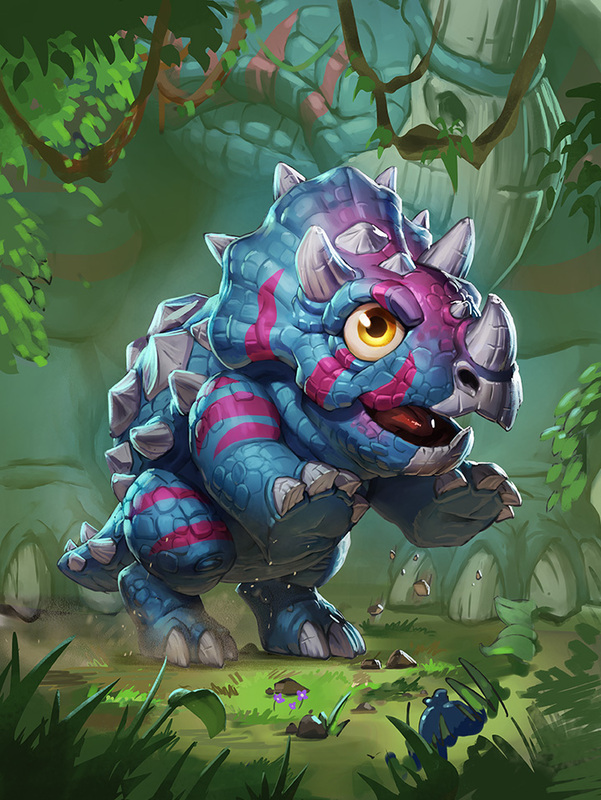 The list boasts a whopping 15 taunts, and it includes Stonehill Defender and Direhorn Hatchling that create even more taunts when played. It is an ultra-defensive list with two copies of Brawl (and a Dirty Rat to pull even more of your opponent’s resources into a Brawl) and both King Mosh and Deathwing: once you have your Ragnaros Hero Power, you just want to keep the board nice and clean. 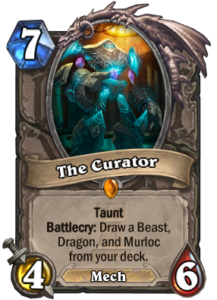 The Curator is used for card draw to pull either Primordial Drake or Deathwing and one of the many beasts, all of whom except for King Mosh have taunt. I have cut Shield Slam, as there does not seem to be a good enough way to gain enough armor. Alley Armorsmith can help, sure, and I could run Shield Block, but running Shield Block would mean dedicating four slots just to have that Shield Slam available. Slam and The Curator provide some card draw, with Stonehill Defender acting as pseudo-draw. Maybe there are ways to cut down on those taunts, and perhaps the Shield Slam package would make sense, as Shield Block does cycle itself, but right now this is my attempt to create a Control Warrior with a clear, singular purpose to win through the Ragnaros Hero Power. 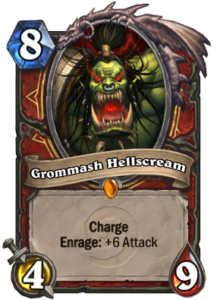 If more top-end was to be added, Grommash Hellscream is potential candidate, perhaps even a replacement for one of the top end board-clear minions. There is also another path available. The path of tempo. Here is my initial draft for a Tempo Quest Warrior. This deck attempts to apply pressure and complete the quest when it is otherwise running out of steam to have that one more go at winning the game. 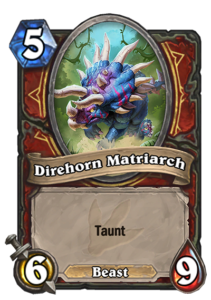 Working towards this goal, the deck boasts 9 taunts, again including Stonehill Defender and Direhorn Hatchling that create even more taunts when played. 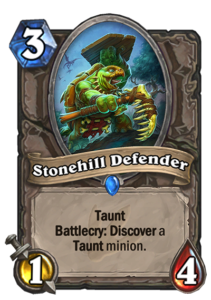 Stonehill Defender is the only taunt minion in the deck that is suited for nothing but defense. All the others have a bit better attack value to be able to apply that pressure. 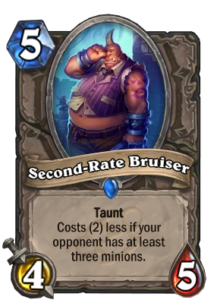 I believe this is a compromise needed for the quest, as Stonehill Defender advances the quest so nicely and has a good chance to provide you with a more offense-minded taunt minion. 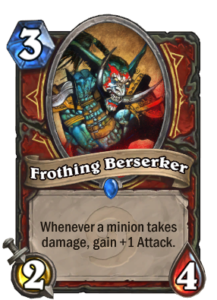 Frothing Berserkers can hide behind taunts and grow to be powerful threats, and card draw is provided by Battle Rages, Slams, and The Curator. 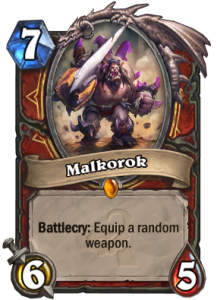 The list includes Malkorok for a 7-drop: it receives a rather sizable boost with the rotation, as Cursed Blade, the bane of Malkorok players in high-profile matches, is rotating out. The average quality of weapons is going up, and Molten Blade is the only bad new weapon, and even that does not instantly lose you the game, so it’s all good. Despite multiple Whirlwind effects, I have chosen to go for Deathwing over King Mosh as the final board clear: Deathwing is unconditional so I can freely use whirlwinds early on with Battle Rage and Executes, and this way the deck was able to fit in a dragon for a potential The Curator draw. Primordial Drake just does not have the same tempo impact, it is a more defensive card. If Deathwing was cut for King Mosh, I’m not sure if it would be worth running The Curator either, so even something like an Alley Armorsmith could find its way into the deck in that case. I just dislike the statline for a tempo deck and do not want to compromise too much. I would have actually been interested in running Evil Heckler in the list for that aggressive statline, too bad it is rotating into Wild. 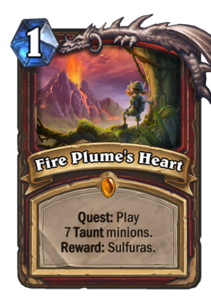 It will be interesting to see what kind of Quest Warrior is the best one and how many taunts you need to run in the end. I am a little concerned that the quest condition might prove to be more difficult to fulfill than it looks, in which case there might be more room for a non-quest Tempo Warrior, for example, but we’ll see once we get to play with the new set.